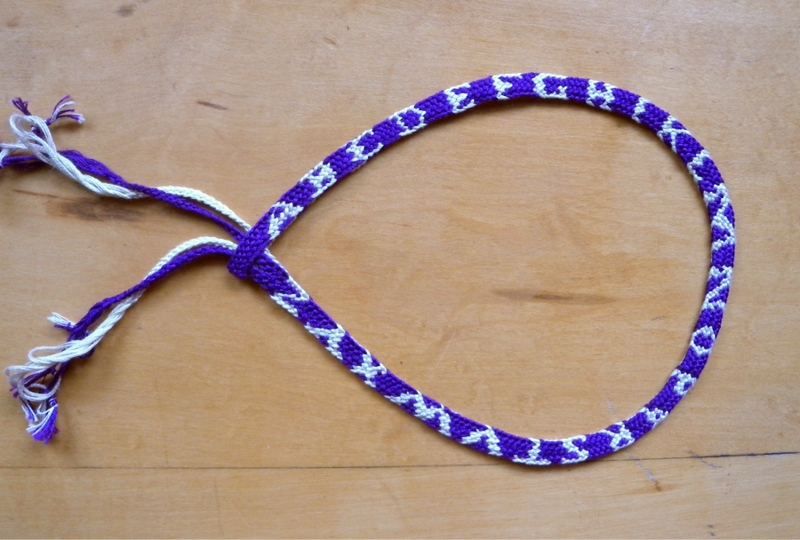 This technique of making two-color motifs and patterns by swapping light-color strands with dark-color strands between two braided (or more often woven) layers is often called “complementary pick-up patterning,” though I don’t think Noemi Speiser or Joy Boutrup have used that term in reference to the letterbraids. Page numbers apply to Speiser and Boutrup’s Letterbraid publication. 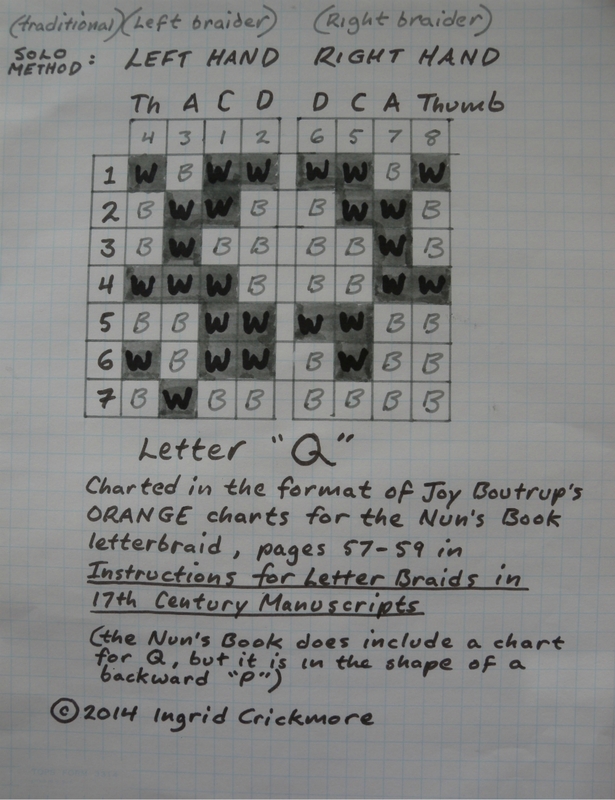 You don’t need their publication to follow my tutorial, but you’ll need it afterwards if you want to braid other letters than U, J, and Q.
Update: I recently found out that Gary Mitchell has posted all the Nun’s Book charts for the original alphabet letters on his FingerTips site! (with Joy Boutrup’s permission) They are available here (link will open in separate tab) without having to purchase the Speiser/Boutrup publication (though the publication has more complete information, plus an errata list). Not only that, but you can also plan your own patterns for the Nun’s Braid Letterbraid on his site – click on his second planner (skip the ‘Lady Bindloss’ planner – that’s for yet another letterbraid that I haven’t taught here). The braided letters J, U, and Q above are not from the Nun’s Book charts. In the 17th C. the letter “I” was used for both “I” and “J”, and the letter “V” was used for both “V” and “U”. The letter “Q” did exist in the 17th C, but the Nun’s Book chart for it is in the shape of a lower-case “q”, which to me doesn’t read clearly as a “Q”. * So I’ve made up charts for a more standard-looking Q, and for the letters J and U.
Click letters to see–and print for your own use–my charts for the letters U, J, and Q. (Charts will open in a new tab in your browser) Note: The charted letters display sideways in charts, the way they show up as you braid–bottom of the letter on the left edge of the chart and braid. My second video explains how to follow these charts. Re the “jumbled” look of the charted letter-shapes: See Jen’s question in the comment field below this post (it was the 1st comment, so it may be way at the bottom of the list), and my suggestion on how to work around this if you are trying to create your own motifs…Oops! just noticed I forgot to fill in the B’s for “black” in the J chart’s background squares. It might seem unnecessary, but I find it easier to read a line of the chart to myself if the B’s are there. If you print this out, just fill in the missing B’s in the empty squares. 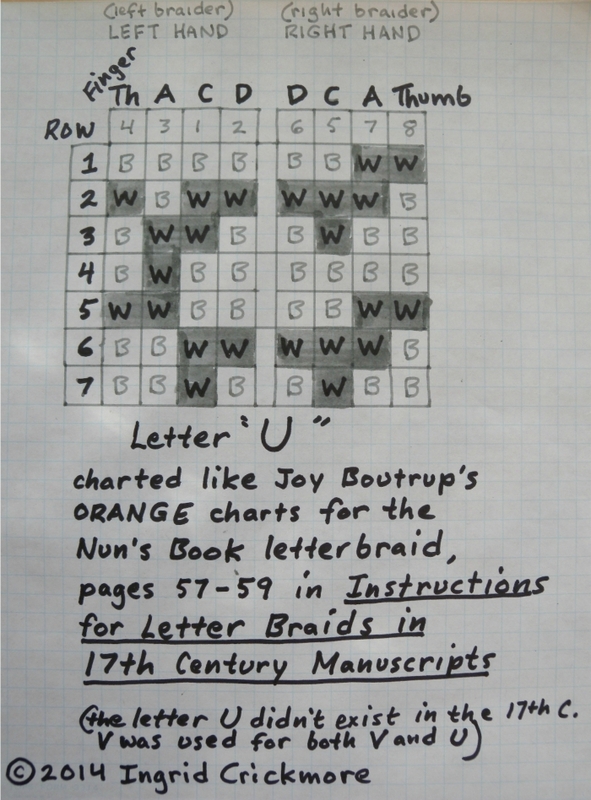 For this “Nun’s Book” letterbraid, Joy Boutrup deduced two methods that both work for following the Nun’s Letterbraid charts, each with a different order to the braiding moves. My interpretation here for a solo braider is based on her first method, which she outlines on page 56, not on her second method (described on p. 60). Later on, if you want to go from my tutorial to braiding actual inscriptions, you would use the moves I teach below, along with Joy Boutrup’s ORANGE Nun’s Book charts on pp. 57–59 of the Speiser and Boutrup Letterbraid book (NOT the yellow Nun’s Book charts pp. 61-63). Material: I recommend cotton embroidery floss for learning this braid. I used bulky yarn in the videos so it would be more visible, but floss is easier to tighten evenly, and I think its untwisted strands help the letters stand out more clearly. From what I remember in Joy Boutrup’s letterbraid book, the few extant letterbraid samples from the 17th C. were all made with of filament silk, in fine flosslike bundles barely or not at all twisted/’thrown’. Filament silk yarn or thread is made from very long lengths of silk filament; as opposed to (modern) spun silk which is made from chopped up, carded, short lengths of silk (less glossy, weaker, and more prone to pilling than actual filament silk.) Silk yarn and embroidery thread nowadays is often made from spun silk. Silk beading thread should be filament silk, but it’s highly twisted, which would give a different effect than the flosslike strands used in samples in the old English braiding books. This video teaches the braiding moves only, not the color-switching moves for forming the letters. Each ‘row’ or cycle of braiding moves has 4 main braiding moves per hand, followed by a loop-exchange move between the two hands at the end of the cycle. A letterbraid is braided as a completely divided braid (two separate layers, one above the other). This is done by not turning any of the loops while doing the braiding moves. Keep checking to make sure that the two layers of the braid are not connected at any point. That’s the best way to be sure that you’re not turning any loops, and–a little tricky with this braid–that you aren’t inserting your finger in the wrong direction through any of the loops. Drag bubble under video to time-point you want to see. 2:35 Loop set-up on the fingers. 3:37 First run-through of the braiding moves, very slowly. 11:02 Final move: Loop exchange between left and right D-fingers. 11:27 Last tightening move in this row (cycle) of braiding. 15:07 Checking to make sure that the braid is forming as two completely divided layers – describing possible problem of taking a loop through another loop “backwards”. 21:07 showing abstract designs on start of braid, followed by the completely divided area I have just been braiding. 22:14 About the yarn I’ve been using –thicker than I like for letterbraids. Other samples I show are made with embroidery floss. 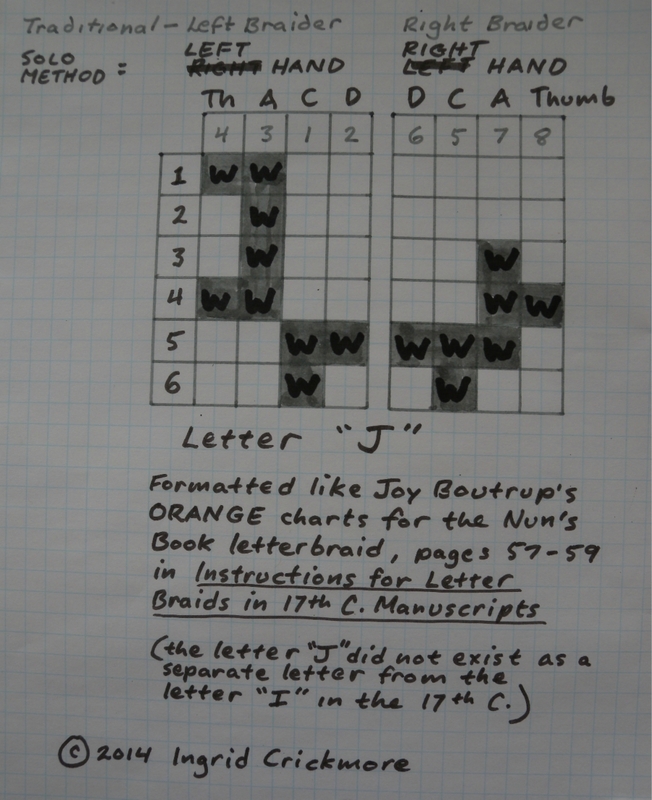 1:25 How to read/ interpret a chart in the format of Joy Boutrup’s ORANGE charts for the Nun’s letterbraid (pp. 57-59), not her yellow charts. 4:14 How loops are turned while reading the the chart, starting with Row 1. 5:48 How to tell which part of the thumb-loop is the “UPPER” shank. 7:33 Tightening tip. In the video I am braiding around the camera and can’t see the fell of the braid well enough to follow my own advice! But for making well-shaped letters, it really helps to watch when tightening and adjust accordingly. 7:52 Do the loop exchange BEFORE turning colors for the next row! 8:13 Reading and braiding Row 2. 14:01 Pausing to check the braid. Info about delay in seeing the pattern on the braid. 16:02 Reading and braiding row 4. 17:28 Reading and braiding row 5. 18:34 Pausing to check a possible mistake. 19:21 Reading and braiding row 6. 19:56 How to fussy-tighten one particular strand that is loose in the braid, and not responding to “regular” adjustments. This should only be necessary once in a while, if one thread is grossly loose in a previously tightened area of the braid. In general, I adjust the tension by pulling more in one direction than another, or maybe repeating an earlier tightening move, not by pulling on individual threads. 21:09 Recovering from “losing my place” in the braiding procedure. 22:37 Reading and braiding the last row – row 7. 23:55 Letter finished, now doing one or two rows of “space” before starting next letter. Tips about spacing the letters. 27:41 U and following space is done, now checking the letter to see how it turned out (a bit slanted). 10-loop Spanish braids: a letterbraid, and a wider flat braid. The wider braid was made with the same braiding moves, except in having one turned transfer, connecting the two layers along one edge so they can later be opened and spread flat. Both braids are mostly plain weave, braided as 2 layers (“double weave”), using bicolor loops (reds + ecru; and purple + gold). Wider braid is now a single layer after being opened out; narrower braid has complementary pick-up patterning between the two layers of plain weave, which holds the two layers together. Finger loop braiding with DMC brand cotton embroidery floss, and (in the purple and gold braid) a gold rayon embroidery thread (unknown brand). It takes practice to get used to these braiding moves, as with any new braid. But it happens faster than you might think when you are first trying them. Once your fingers “get” that the first two moves are a pair, and the second two moves are a similar pair, they will start to relax and know where to go next in the braiding moves. Everything will feel smoother and more enjoyable at this point. At this point you have learned the braid! And it’s a great braid—even without any charted designs. It can be made with twice as many variations as the braids that I call double braids. Even if you don’t get into making charted designs, just the “regular” braid designs that you can make are almost endlessly variable and interesting! Please contact me if you have any questions or would like to show me a braid. You can reach me through the comment form below, or through the email form under the “Contact” tab in my upper menu [Note: my contact form is now in the drop-down list if you hover on the “ABOUT” tab – upper right of the top menu on every page]. If you’d like to send me a photo, email me and I’ll let you know how to do it. I’d love to see it! 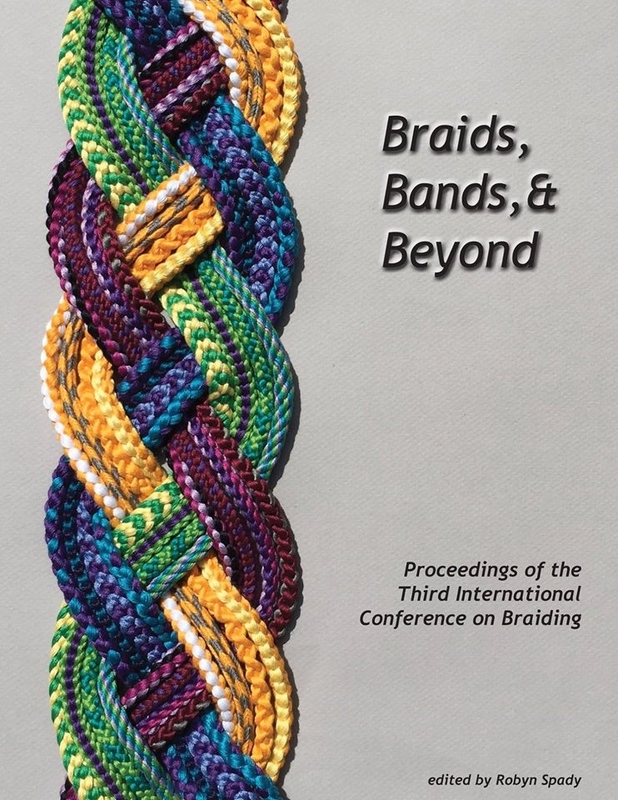 I’ll be teaching a simplified version of this braid at the next international Braids conference—Braids 2016. The simplified version has only 8 loops, so no thumbs. It’s a great braid for learning how to braid and plan simpler charted motifs than letters—hearts, circles, triangles, etc! My new series of tutorials on pick-up patterning explain and teach this starting with square and flat braids, up to (coming soon!) Spanish-type and double braids. *There are three (known) 17th C. letterbraids, one of 14 loops and two of 10 loops. Noémi Speiser and Joy Boutrup call one of the two ten-loop letter braids the “Nun’s Book letterbraid,” after the only manuscript in which it’s been found. 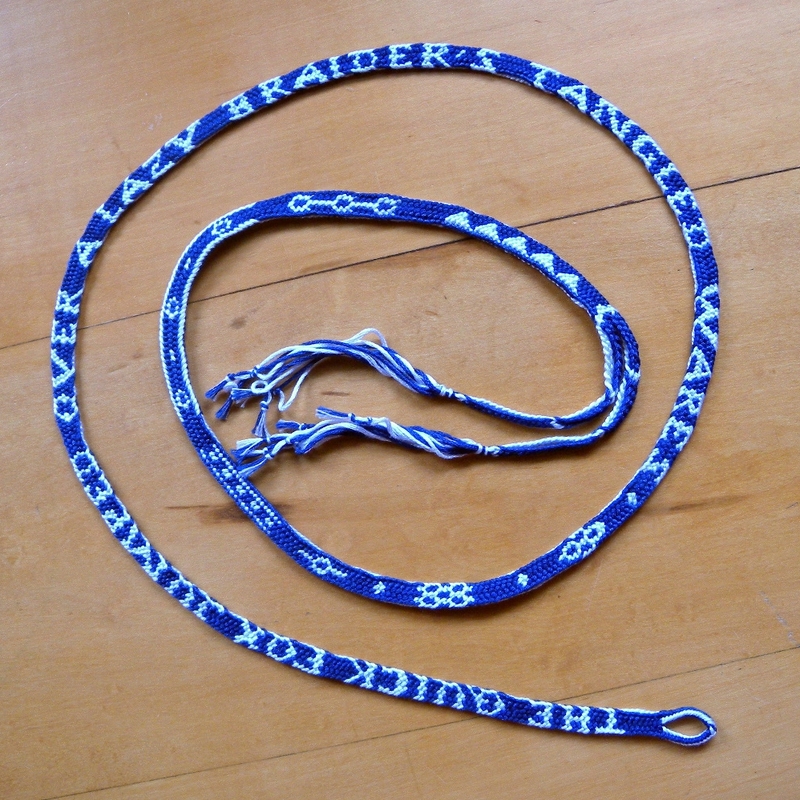 They refer to the other ten-loop letterbraid as “the Verbal Letterbraid” because it had text directions for making the color-changes instead of charts. The only differences between the “Verbal” and the “Nun’s Book” 10-loop letterbraids are in the slightly different shapes of their charted letters (this is due to the designers – theoretically the same exact letter-shapes could be made with either braid), and in the order that the four main braiding moves (of each braider) are done. Structurally, they are essentially the same braid. There is only one minor structural difference that I’m aware of. For certain letters in the ‘verbal’ letterbraid the braiders are occasionally called upon to turn the loops for the following row before doing the final loop exchange for the previous row, which is never the case for the Nun’s letterbraid. This does cause a little structural difference in the braid at that point. This technique for ‘smoothing out’ some of the lettershapes could in theory be done in the Nun’s letterbraid as well, but apparently wasn’t used. But just considering the underlying braid (and ignoring the slightly different designs of their letters), the Verbal and the Nun’s Book letterbraids are really the same doubled 5-loop ‘Spanish’ braid. ‘Spanish’ braids: Five loops is the minimum number needed for braiding a so-called Spanish braid. A spanish braid is essentially the same as what I call a “Double Braid”. It’s a braid in which a braider makes 2 loop transfers on the left half of the braid and 2 loop transfers on the right. So 4 loop transfers in each ‘row’ of braiding – twice as many as in a basic square braid. With only 5 loops – the minimum for a 4-transfer braid like this – the resulting structure is plain interlacing/ plain-weave. “Under one, over one” across both braid layers. The extra ‘over’ in the middle of a letterbraid: When a plain-weave 5-loop braid is doubled into a 10-loop letterbraid of 8 columns across, one column on one side of the center of the braid ends up being under/over two (2/2 twill) rather than plain weave – a result of the loop exchange between the two braiders. The rest of the columns in a 10-loop letterbraid are all plain-weave (1/1). Fell-shapes: The 8 interlacing moves in a letterbraid are done in 1 of several possible sequences. Maybe the inner transfers first, outer transfers second, etc etc. There are several possible orders, all of which result in the same braid — the same threads passing over and under each other in plain-weave (with one central column of 2/2 twill, see above). These different sequences create what Joy Boutrup refers to as different “fells” or “fell shapes”. Depending on the order in which you do the 8 given interlacing moves, the working edge or fell of the braided area will have a differently-shaped contour at the end of each cycle of braiding (one full ‘row’ of all the moves). This is sort of a superficial difference in that it only applies to the continually changing lower edge of the developing braid. That contour changes a bit each time you transfer a loop. After the thumb-to-index loop transfer, the fell shape at that point is different than after the b-loop-to-c-finger transfer. But the braid itself that is being built by these eight given interlacing moves will end up with the exact same structure regardless of which of the several possible order of moves (and their resulting fell-shapes) the braider uses. Even with a regular braided color pattern that doesn’t involve charted color-switching (pick-up patterning), changing the order of the moves would likely require a different starting set-up arrangement of the colors of the loops. Even though the Nun’s book color-charts don’t work for the Verbal letterbraid and vice-versa, both 10-loop letterbraids are basically the same braid – you really could just pick whichever order of operations feels the most comfortable to you and make the same 10-loop/ 20-strand braid with either method…or even a few other orders of making those same ‘through’ and ‘around’ loop moves. The way I demo this braid follows the first of two possible braiding methods that Joy Boutrup deduced from the Nun’s Book instructions. She first assumed that the two braiders would turn loops on their fingers (following a chart) before doing a row of braiding moves. The braiding moves for that method are given on page 56 of Boutrup and Speiser’s Letterbraid book. This way of following the charts — turning loops before doing the braiding moves — is how both the other two 17th C. letterbraids are known to have been done, and I think it’s easier to learn than the second method that Joy deduced. The second possible method that Joy Boutrup deduced requires that the two braiders turn loops while doing the braiding moves. This requires following a different order of the same braiding moves. That order of braiding moves is described on page 60, and the accompanying charts are in yellow. The second method includes the same four loop transfers, but they must be done in a different order. Turning the loops while doing the braiding moves is not how the other two known letterbraids were done, so it might seem less likely that it was the method used by the writer of the Nun’s Book. Either of the two ways of following the charts produces the same letter shapes. The first method is a little slower, but feels more relaxed. First you read a line of the chart to find out which loops to turn, then you turn them on the fingers, and then you braid a row, using the exact same braiding moves every time. (That’s the method I used in these videos.) The second method requires more concentration while braiding, and the braiding moves are a little different every time, depending on which loops need to be turned. It does feel like a faster way to braid the letters, and it’s the way I prefer to braid them now that I’m more used to these braids. The other two 17th C. letterbraids in Joy Boutrup’s book were both described as using the first method, the one I demo in the second video above – all loops turned (according to the chart) before the braiding moves are performed. * The rotational directions of the loops’ turns can have a slight-to-fairly-big effect on how the finished braid turns out, but the original manuscripts don’t specify which direction to turn loops. For us poor souls who did not get the chance to attend the Braids 2016 conference, is there any possibility that you might post a tutorial of the modification you taught there? No worries! Thanks for your response. If you don’t mind my asking, why is the pickup patterning not teachable here? How is it different from the ten-loop braid? I don’t mind at all! It’s true that all the letterbraids, including the 10-loop letterbraids are definitely made with pick-up patterning. So in that sense I did teach pick-up patterning here in this Nun’s letterbraid tutorial. But my focus was just on teaching how to follow Joy Boutrup’s charts for making these particular lettershapes, not really on getting across the basics of how pickup patterning works. This tutorial kind of exhausted me, to tell the truth – after finishing it, I was not very keen on going much further with letterbraid or pick-up patterning tutorials. But since then I’ve changed my mind about not teaching any more about pickup patterning on this blog. See my more recent posts starting with Pick-up 101. I’m starting with pick-up patterning in easier braids — (2-pass) square and flat braids and working up to braids that have 4 passes (4 loop transfers in each row of work). Probably it would have made more sense to post these tutorials first and the letterbraid one later! but I didn’t have that on my mind back in 2014. I didn’t start thinking about doing this series until this last summer. Thank you for your answer! I asked mainly because I would really like to make some of the 8-loop letterbraids with the patterns as shown in this photo. https://goo.gl/images/h4zPkS I’m especially interested in the green and white one on the left. Is there some way that a chart could be made and followed? I also just want thank you for all the work you’ve put into this. I discovered your website two days ago and have already made nine braids of differing complexities. I’ve even made a barleycorn and tried a square braid pick-up pattern. Thank you for your help! Hi again that was a fast turnaround! Those 8-loop “non-letterbraids” were what I taught at Braids 2016, I’m glad you like them! I have charts for all those patterns, but I’m not sure whether I will end up teaching them here or not. I’ll probably wait and see how this series goes over. So far, I’ve covered square and flat 2-pass braids. Double braids/ Doug’s braid will be next – they are 4-pass (4-transfer) braids. This “non-letterbraid” has 6 transfers, so it’s a bit harder than double braids. Have you tried the 8 loop double braid yet? Thank you! I just tried the 8-loop double braid as per your suggestion, and I like it. I tried to do the one loop wrong pattern, but I must have done something weird, because it turned out as an “edge” pattern with breaks and little arrows. I do hope you decide to teach those patterns, I would be happy to learn them. Thank you for your help! Your description sounds just like what “one-loop-wrong” should look like in a double braid! It’s a variant of Edge. Wish I could see it! If you ever want to send me a photo, just email me on my contact form (under ‘About’ in header menu) and I’ll let you know how to send it. The wordpress contact form doesn’t allow attachments for security reasons. I am really impressed at your learning all those braids this fast btw! This is just wonderful! I havent tried it my self but I know your tutorials are the best! Bookmarked and I will soon start with following your instructions. Hi Maarten, you’re welcome and thanks for the note! Oooh, fun. So my question is why do the charts looks so jumbled up? Is there a pattern to them I am not seeing? For example, the chart for ‘U’ looks nothing like the finished letter in the braid. I am interested in creating some free form designs – is there any tip you can give to help me figure out where a turned loop will show up in the woven pattern? I plan on experimenting, but any advice would be appreciated. Great video! Thank you so much for sharing your time and expertise. I find your tutorials so easy to follow and I’ve been having fun with them. Hi Jen, Thanks! I’m so glad you’ve been using and liking the tutorials! You can plan patterns better in that format, but afterwards you might want re-draw the charts into Joy’s column order to braid from, so they will be easier to follow. Reordering the columns this way will give a slightly better idea of how the charted image will look on the braid, but it still won’t be perfect. The real ‘pixels’ in the braid are short, zig-zagging slants that don’t line up in a row in the same way that graph paper squares line up neatly next to each other! So it’s good to be prepared for a certain amount of trial and error in planning / charting new designs. Joy Boutrup’s letterbraid monograph shows graphs of the finished letter-shapes in which the cells are actually slanted like the real braid ‘pixels’, but the scale is small, and it’s not always easy to follow the true grain of a zig-zagging horizontal row for planning purposes. Copying and blowing them up might help. I was wondering if putting the rows in order would help clarify, but when I tried it (quick and rough) it didn’t seem like I was on the right track. Thanks for the heads up! Re the original order of the columns that you probably tried (1,2,3, etc rather than Joy’s reordering 4,3,1,2,6,5,7,8) — That order is exactly the order of the loop transfers for Joy’s second deduced method! For that method, the first move would be to go through Lc and take Lb (original column 1), turning it or not turning it to make it end up on its new finger with the color shown in column 1 of the chart in upper position. Hi Jen, I don’t know if you are still interested in planning patterns for the Nun’s letterbraid? 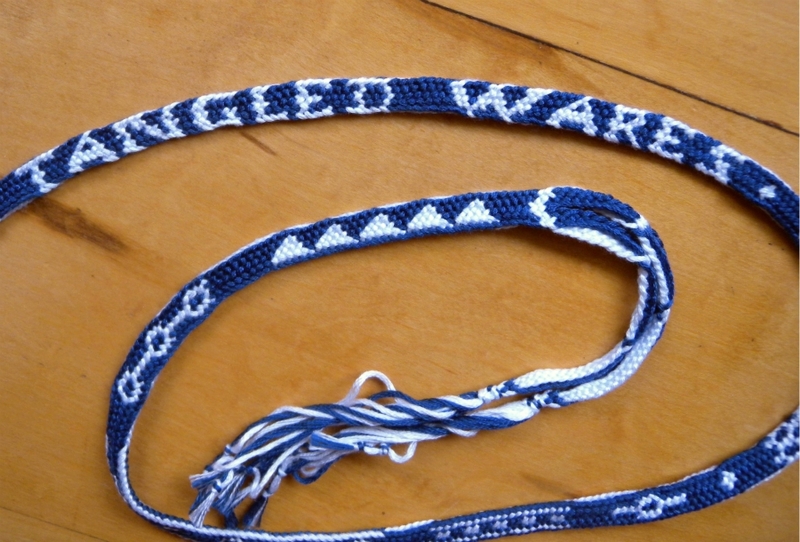 Gary Mitchell has an interactive pattern planner for the Nun’s letterbraid on his site now! You can use it to plan your own patterns and see what they will look like – in a simplified block form, but much more accurate than graph-paper squares. He tells me he’s also working on one for the 10-loop double braid that I teach on my blog . See my new note with link in the Nun’s Letterbraid post. I would love to see any designs you end up braiding! Happy New Year, and happy braiding/ planning!